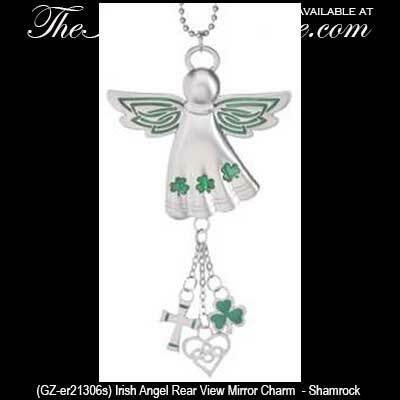 This shamrock Irish angel car charm hangs from your rear view mirror. The Irish angle rear view mirror charm additionally includes a shamrock, a Celtic knot heart and a Cross dangling charms. 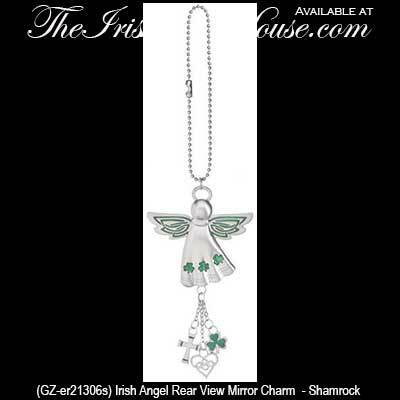 The Irish angle car charm with shamrocks and additional Irish charms is ready to hang from your rear view mirror. The Irish rear view mirror car charm measures 2" wide x 7” long and is gift boxed with a bit of shamrock and Celtic knot history. The Irish Angel Rear View Mirror Charm features green enamel accents.